Carolyn Greenough’s research was recently featured in an article by NH EPSCoR. Her work focused on how key stakeholders in the Lakes and White Mountains regions of New Hampshire value their scenic views when considering the impact of large-scale energy projects. Carolyn was a student at the Center for the Environment while working toward her MS in Environmental Science and Policy at Plymouth State University which she completed in May 2017. 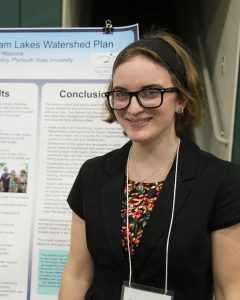 In addition to her research and course work, Carolyn assisted with a variety of projects including helping to organize the NH Water and Watershed Conference.